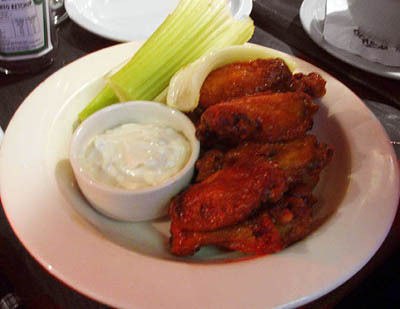 For starters, pick the buffalo wings if you want to really know if buffalos do have wings. 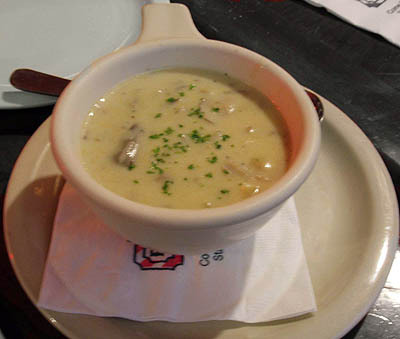 Served with celery and mayonnaise (with bits and pieces of creamy cheese mixed together), this meal is great way to prepare your stomach for the main course. Marinade with their own special house sauce, the buffalo wings are what layman terms call bbq chicken. 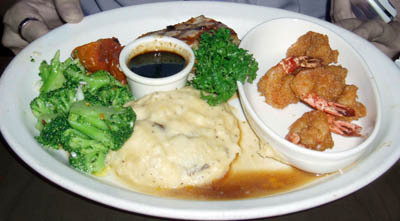 Nevertheless, TGIF’s made this seemingly normal dish extraordinarily special. If you fancy some poultry for your main course, try the Jack Daniel’s special. 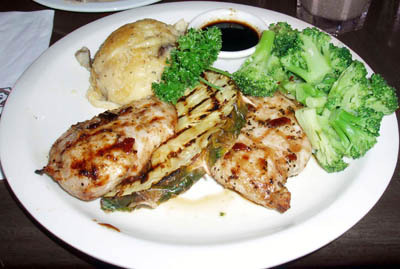 The dish below is served with cooked brocolli, mashed potatoes, grilled pine, grilled chicken breast and Jack’s own special sauce which tastes sweet. For dessert, I recommend the mudcake. Topped with chocolate and almond, its definately something wonderful for chocolate lover. The texture of the cake seems more like frozen chocolate ice-cream and cake mixed together. I wonder if that’s how it tastes like since its the first time I’ve tried the mudcake. One thing though, this piece of dessert is fit for 3 people to enjoy! Definately worth’s one price. 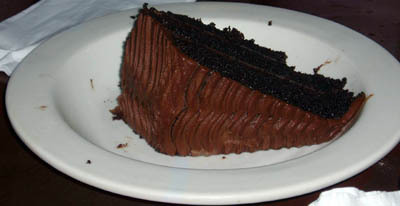 Not enough of chocolate, then try their chocolate moist cake. Words can’t describe the taste but I think its a wonderful dessert too. 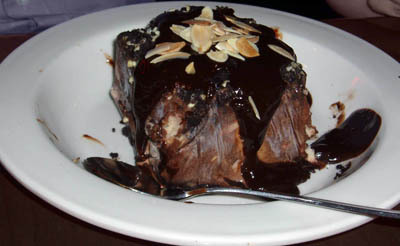 One more dessert that one should try if you drop by TGIF would be the brownies. Topped with ice cream, they have made this dessert seem like you are in heaven. Not too sweet and yet chocolately with the coldness of the vanilla ice crea, its not wonder we all Thank God its Friday! Like to visit their international site? Then log on here for a glimpse of what they offer at other countries. This entry was posted on Sunday, June 11th, 2006 at 12:38 pm	and is filed under Western Food. You can follow any responses to this entry through the RSS 2.0 feed. You can leave a response, or trackback from your own site. Been to quite a few TGIF restaurants and the stores of their main competitor, Chili’s. TGIF has by far the superior & friendlier customer service compared to some of the numpties who work at Chili’s. Btw, I like TGIF’s supersized nacho’s. I’m such a regular that I’ve tasted almost all their main course there and tried all their ice blended. Top ten also not a bad drink. Overall I give it a 8 out of 10. Yummy it looks great. To good to eat! this looks great! I might have to have a go at making these! yum,my sis and I are currently drueling at this current moment ove this fab food. All id like to say is’Thank god its nealy friday!’ TGINF! long time since i visit this site n behold it blossom .jb have a tgif n i m sorry to say the food is overprice n taste ok .
well this is the restaurant i havent step in the second time.